Over time, diabetes may affect many areas of the body. The eyes are no exception. Diabetes can produce varying degrees of vision loss.Diabetes threatens vision because it may damage the retina, the delicate inner lining that sends visual messages to the brain. 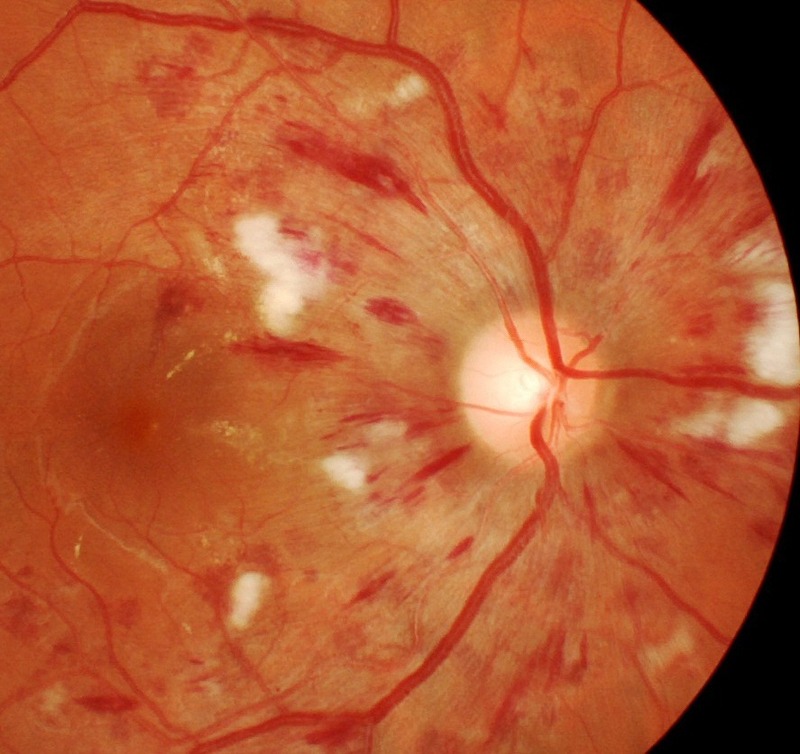 Diabetic retinopathy is “silent” with no outward symptoms in its early stages. It's not until the later stages that vision loss is noticeable. Anyone who has had diabetes for more than 10 years is a prime target for diabetic retinopathy. Detected early, it can be monitored and treated most of the time. Left untreated, it may lead to blindness and other complications. The retina is a fragile and transparent membrane. It contains tiny blood vessels that provide it with nutrition. Diabetes is when the body lacks the ability (insulin)to take the nutrition (sugar) in the blood and properly disperse it to all the tissues in the body. This includes the walls of the blood vessels. That's why people with uncontrolled or undiagnosed diabetes have high blood sugar levels. Because these tissues do not get the proper nutrition, they weaken, and in the case of blood vessels, they improperly, leak blood and protein into the surrounding tissues.A good example would be if you had a sprinkler at the end of a 50 ft garden hose that was run across the length of your driveway and you needed to water the grass at the end. The hose had holes in it all along the way. When you turn the water on, much of the water leaks out of the holes onto the driveway and by the time the water gets to the end, there is minimal pressure work the sprinkler. What you are left with, is water all along the side of the hose on the driveway, which is useless, and little water at the end to water the grass. 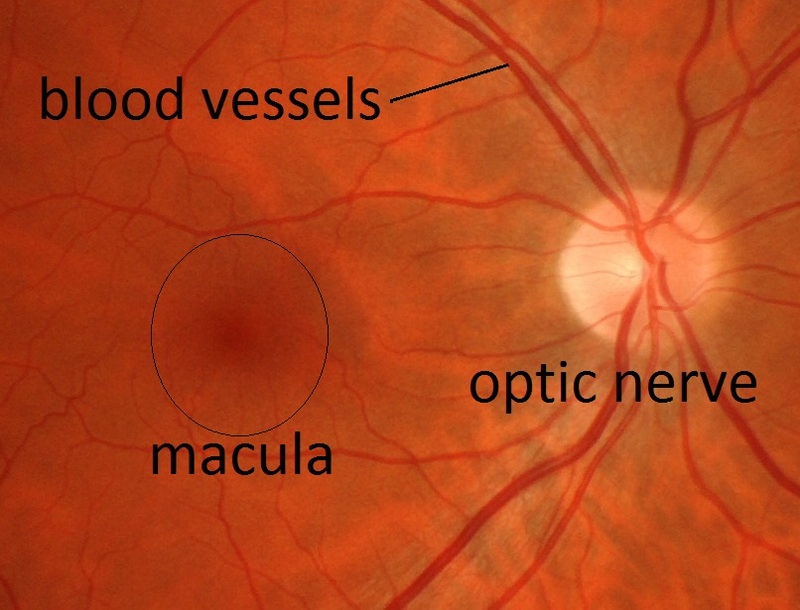 When this happens in the retina, it can cause local swelling and affect your vision. This is the reason people with diabetes, often have problems seeing out of their glasses. If these changes are happening and detected in the eye, there is a high probability that they are also occurring in other body organs, such as the kidneys or feet. That's why the eyes are often referred to as "THE WINDOW TO THE BODY. "....thus the importance of regular eye/health examinations. This swelling is only one of the complications of diabetic retinopathy. The body's response to the lack of nutrition is to develop additional small, The retina can also develop abnormal vessels and scar tissue, causing it to function improperly. The abnormal blood vessels are fragile. 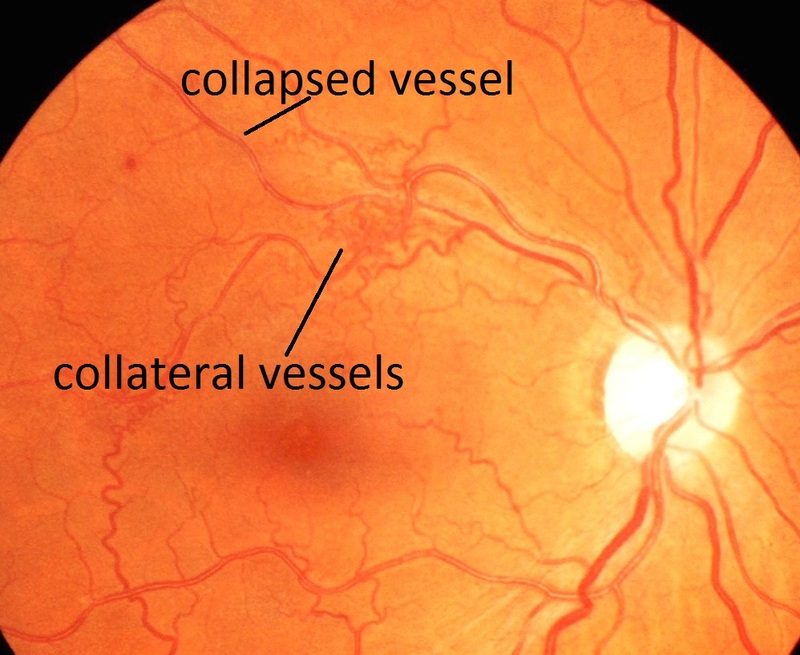 If the vessels burst, blood will fill the back of the eye and prevent light from reaching the retina. The result is a loss of vision. 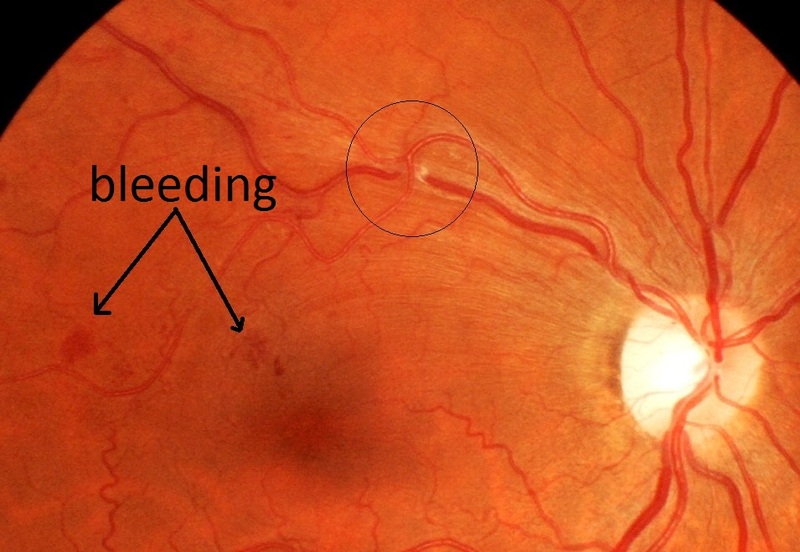 Retinal Photography allows us to compare any bleeding from previous visits. 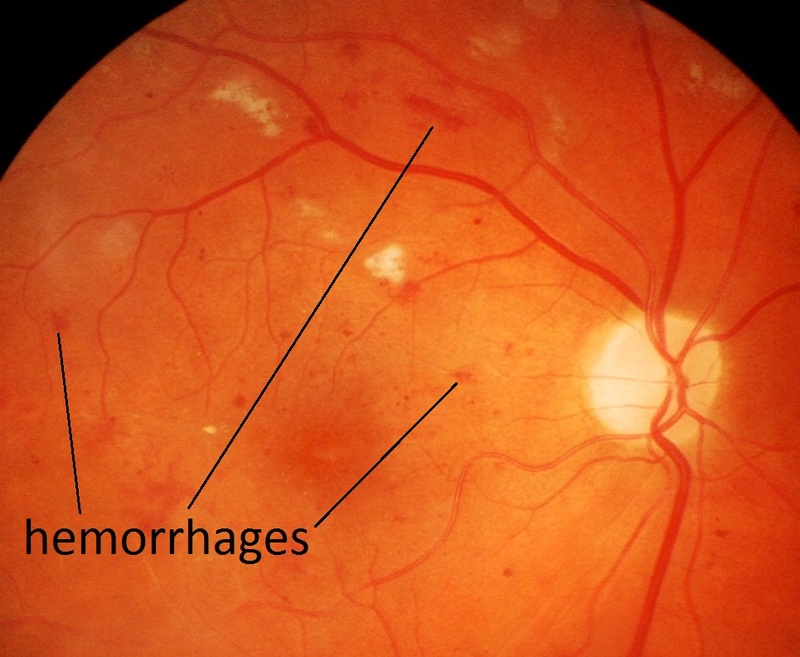 Diabetic retinopathy with hemorrhages and white exudates throughout the retina. Diabetes causes leakage of the blood vessels due to lack of nourishment from the body's inability to produce insulin. Many patients are unaware they have diabetes until they have an eye exam. The eyes can also be an indicator of poor blood sugar control in those patients that have been diagnosed with diabetes. Poor control puts the patient at a much higher risk for other complications throughout the body, like amputations. The technology of theCirrus 5000OCTscans underneath the surface of the retina for any swelling not seen with conventional testing or by the naked eye when viewing the retina. Above: Barbara performing an OCT. 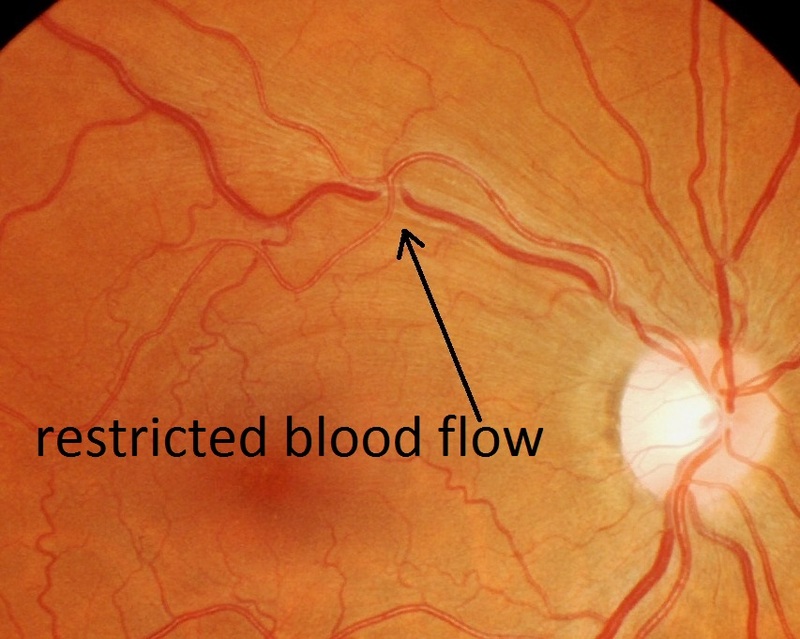 Above: Diabetic Macular Edema (DME). 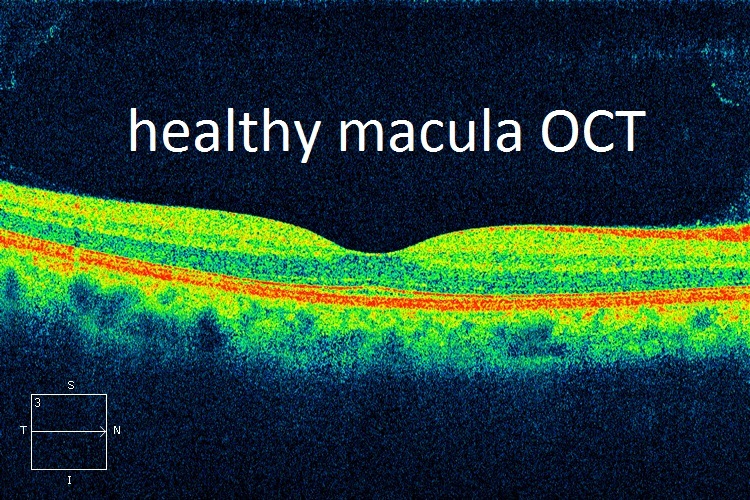 This breakthrough technology provides us with a non-invasive assessment of structures BENEATH the surface of the retina allowing us much earlier detection of macular changes associated with Diabetes and Macular degeneration. Early referral and treatment are essential for preserving vision. DME can now be treated with injections of anti-VEGF agents such as Lucentis. More aggressive treatment is done with a laser. Diabetic retinopathy can be treated before vision loss occurs. Often today, the first line of treatment is injections of an anti-blood vessel growth agent.These eye injections of Avastin, Lucentis, or Eyelea, are done under local anesthetic and need to be performed initially on a monthly basis. These medications actually target and shrink the bleeding blood vessels. If there is any sensation or discomfort, most are due to anxiety. Some people feel little pressure and experience blurred vision after the injections. Additionally, Laser treatment is also successful in slowing the progress of the disease in cases where the injections would no longer be effective. A beam of laser light is directed into the eye to seal the source of leakage and repair the damaged area. While it can improve vision, it cannot reverse scarring of the retina. Extensive laser treatment can constrict one's peripheral vision, and cause difficulty with night time vision. Performed on an outpatient basis, laser treatment is safe, effective, and comfortable for the patient. Most patients are able to resume normal activities shortly afterward. Not all stages of retinopathy require injections or laser surgery. At every stage, however, testing should include measures to ensure that the blood vessels are not leaking blood into the retina. Diabetics are encouraged to have a dilated retinal exam, and/or digital retinal photography at least once a year. We are excited to announce that we have acquired an Optomap from Optos. This state-of-the-art technology takes a 200-degree picture of the eye vs a 45 degree in standard photography, minimizing the need for dilation in many cases. Patients have really endorsed this technology. 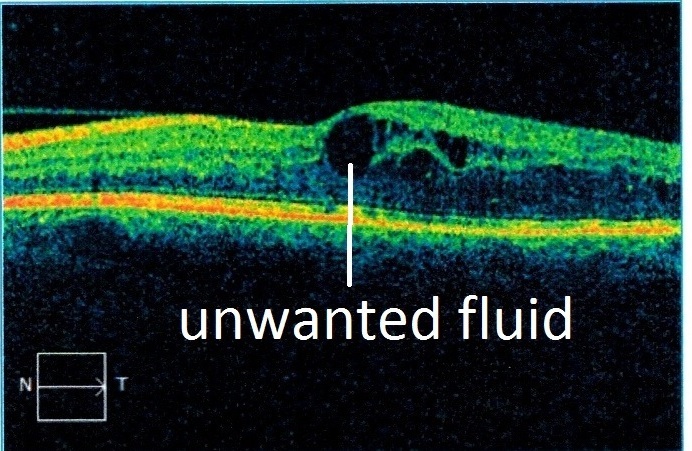 To complement this, we have the Cirrus 5000OCT which scans the layers beneath the surface which allows us to detect even the slightest leakage and allows for early referral and treatment to prevent vision loss. Left: Normal Retina: Right: An eye after PRP (Pan Retinal Photocoagulation), a more aggressive treatment of diabetic retinopathy. The scarring from the laser stops (seals) the bleeding. This patient still had a relatively good central vision, but poor peripheral and night vision. Photos by Skowron Eyecare. Many times, one of the first signs of diabetes is vision fluctuation. You'll get a new pair of glasses, and they only seem to work for a short while, or they don't work at all when you pick them up.If you find that your vision changes suddenly and you are feeling excessively tired or very thirsty or urinating frequently, this could be an early indicator that you may be diabetic. Early detection and treatment are the keys to preventing loss of vision. Stability of your sugar levels is most critical in preventing diabetic changes. We recommend small frequent meals at roughly the same time each day. We have seen patients who have had diabetes for 25 years with no eye complications. Conversely, we have seen patients who have had diabetes for 5 years who have significant diabetic eye disease. Most diabetics will develop some form of diabetic retinopathy. That's why constant evaluation is so critical. In the early stages, diabetic retinopathy is unnoticeable. You won't experience pain or blurring or even be aware you have a problem. It's important for your eyes to be examined so that any diabetic changes that need attention can be properly documented by either an Optos, Retinal photo, and scanned with the OCT.Early detection is essential for successful treatment. If you are diabetic, you need to have a dilated examination each year. 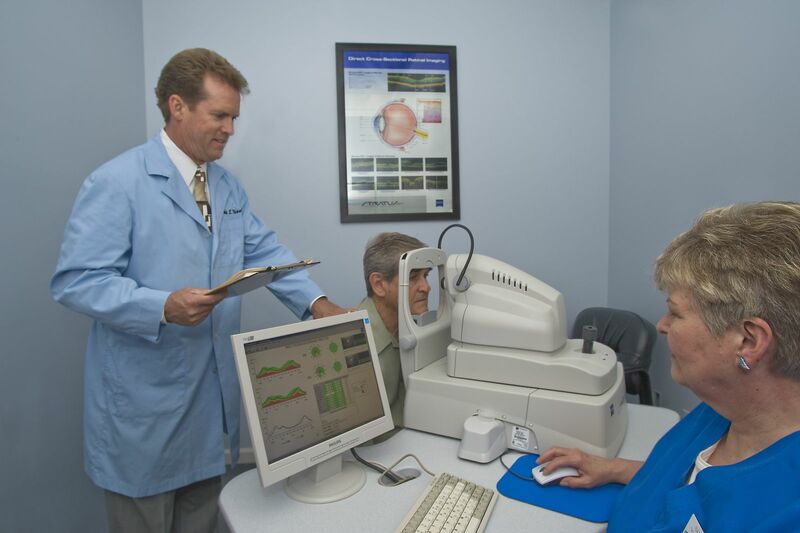 At Skowron Eyecare, because we have the technology of Optos, which takes a 200-degree picture of the back of the retina, most times, we can take those scans in lieu of dilation. patients love this technology because they don't leave the office blurred and light sensitive. If you have poor control of your blood glucose levels, high blood pressure, or protein in the urine, your eye exams should be more frequent. Most people don't realize that High Blood Pressure will also show up in your eye and can have a devastating effect on the vision. That is why at Skowron Eyecare we routinely take blood pressure as part of the comprehensive Eye Health Examination. 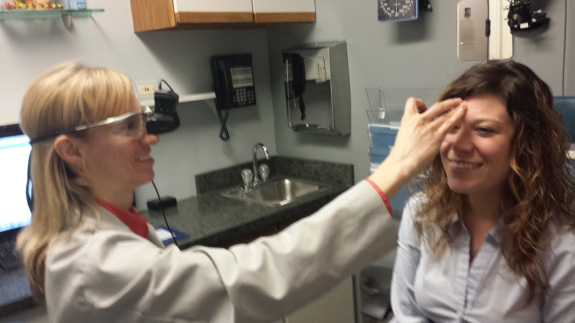 Often, the eye doctor is the only health care provider a patient sees.Over the years we have detected many cases of high blood pressure through the eye exam and have successfully consulted with their Primary Care Physician in efforts to lower it. Hypertension left untreated, can be devastating. It very hard on the organs of the body, especially the heart, and ultimately leads to stroke. Hypertension, like diabetes, can be controlled and treated.Individuals can live a long, full and enriched life. Above: From left to right; Progression of the effects of uncontrolled Hypertension over a three year period. We originally diagnosed HTN, but the patient refused medication. By the third picture, the patient suffered a permanent loss of peripheral vision. The eye can indicate damage to other organs in the body. That's why hypertension is called the "silent killer"
Left: HYPERTENSIVE CRISIS.Blood pressure of 240 /170.The patient thought they needed reading glasses.An immediate referral to the emergency room saved this person from a stroke or death.Once the hypertension was brought under control, by the loss of weight, diet changes, exercise, and proper medication, the eye returned to normal.